After early positive buzz claiming Wonder Woman is the best movie that the DCEU has to offer yet, the anticipation swirling around the Justice League spin-off is higher than ever. With just a few weeks left until fans can see this epic adventure in theaters, new posters have surfaced from both RealD and IMAX, which offer new looks at Diana of Themyscira (Gal Gadot), General Antiope (Robin Wright) and Queen Hippolyta (Connie Nielsen). The RealD poster features Diana showcasing her massive strength by lifting a tank over her head with the greatest of ease, and if you see this movie in a participating RealD theater, this poster could be yours. The RealD Twitter unveiled this poster while revealing that fans who see Wonder Woman in RealD theaters will get to take home this exclusive mini-poster, while supplies last. 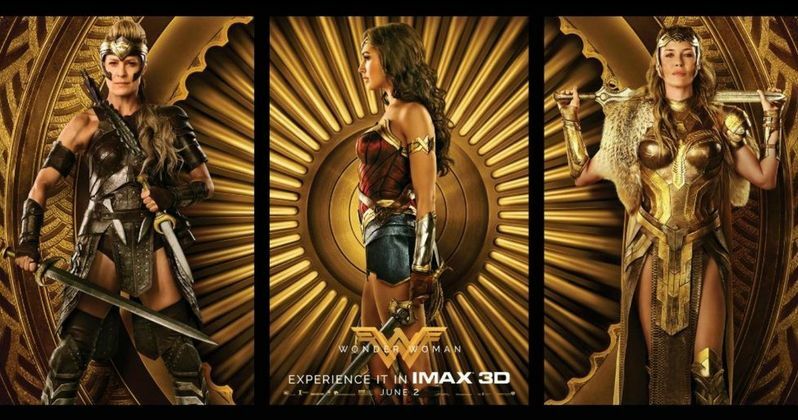 IMAX also took to Twitter to unveil three new character posters, featuring Diana, Antiope and Queen Hippolyta, which form a tryptich image featuring all three of these powerful Amazon warriors. With just under two weeks until this highly-anticipated superhero adventure hits theaters, we don't have long to wait now. Earlier this month, we reported that box office analysts have varying opinions regarding the Wonder Woman opening weekend, with some predicting it will open between $65 million and $80 million, while others have estimated a $105 million debut. These projections, however, came before the first press screenings happened, and given the overwhelmingly positive reactions to the film, it's completely possible that these projections could easily be surpassed, if the buzz keeps growing and growing. Still, it is not expected to surpass the $166.1 million take of last year's Batman v Superman: Dawn of Justice, or the $133.6 million take of Suicide Squad, but it will most likely get much more critical praise than both of those movies. Before she was Wonder Woman (Gal Gadot), she was Diana, princess of the Amazons, trained to be an unconquerable warrior. Raised on a sheltered island paradise, Diana meets an American pilot (Chris Pine) who tells her about the massive conflict that's raging in the outside world. Convinced that she can stop the threat, Diana leaves her home for the first time. Fighting alongside men in a war to end all wars, she finally discovers her full powers and true destiny. Patty Jenkins directs from a script by Will Beall, with a supporting cast that also includes Ewen Bremner, David Thewlis, Danny Huston, Elena Anaya, Lucy Davis and Said Taghmaoui. It was also recently confirmed by producer Charles Roven that there is not a Wonder Woman post-credit scene, stating that he doesn't want to feel 'forced' into doing a post-credit scene in every movie. While there was initially reports that a Wonder Woman sequel won't happen, a follow-up was in fact recently confirmed, although it will come after another female-focused DC movie, Batgirl. While we wait to hear more on Wonder Woman and its forthcoming sequel, take a look at these new posters below.